CEC with other dignitaries during the celebration of International Mother Language Day. Marking International Mother Language Day, a program themed ‘Indigenous languages matter for Development and Reconciliation’ was celebrated on February 21 at Lotsava Auditorium, Cultural Academy. It was organised by Jammu and Kashmir Academy of Art, Culture and Languages Leh in collaboration with Buddhist Association Youth Wing, Culture and Language Welfare Society, Leh and students Welfare Society, CIBS. Jamyang Tsering Namgyal, CEC was the chief guest while Tsewang Thinles, President, Ladakh Buddhist Association was the guest of honour. Jamyang Tsering Namgyal said, “Language is the main identity of society and we all must strive to use our own language and pass on the values. We should be responsible for preserving our language. Also, one should stop blaming the younger generation for not speaking the language properly. The experts should encourage them to learn better”. He also expressed his satisfaction over the younger generation taking a keen interest in the Bhoti language. But unfortunately, they are given less platform and opportunities. He further informed that Hill Council, Leh would give the highest priority for preservation and propagation of Bhoti language. Also, advice to write applications to Hill Council, Leh in Bhoti language. Tsewang Thinles, President LBA highlighted the initiatives and Bhoti promotional programmes organised by LBA for the students in Leh, Jammu and other cities as an annual feature and also informed about their future course of Bhoti learning programmes. He also said Cultural Academy is much more capable of shouldering bigger responsibilities but the constraint of funds is becoming an obstruction in their way. He appealed LAHDC to provide funds to the Academy so that cultural promotion programmes would be carried out smoothly. 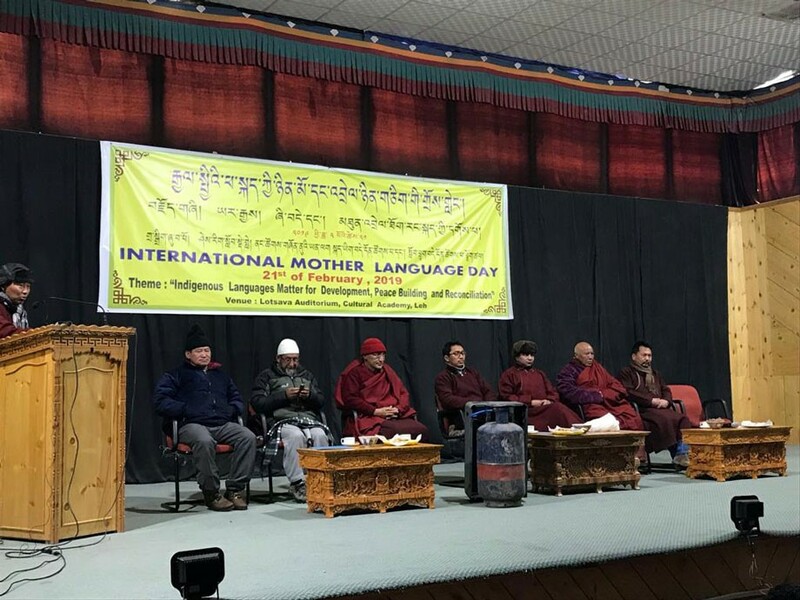 Dr. Thupstan Norbu, Assistant Editor, J&K Culture Academy spoke about the importance of the language and highlighted the history and how the International Mother Language Day is essential to observe. Ven. Shadup Chamba, President, Ladakh Gonpa Association, Konchok Ishey Stak, President, LBA Youth, Dr. Urgain Dadul, Reader of Central Institute of Buddhist Studies, Leh, Haji Riyas Ahmad, Ven. Konchok Gyatso, Molvi Shabir, Ven. Stobdan Paldan, Mohd. Ali and Konchok Tashi also spoke on the occasion and urged every citizen of Ladakh to use own language with the greatest pride.